Scratch and sniff, that’s the coolest stamps on sale now. Just lick and taste it. 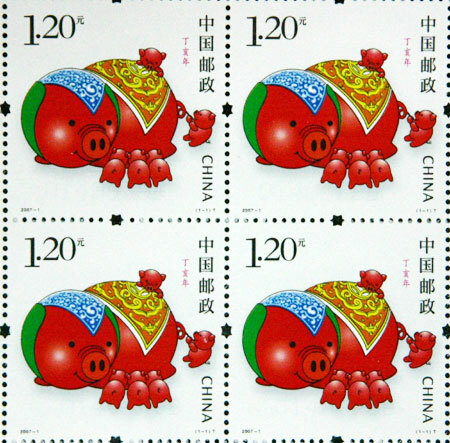 New stamps are released in China to celebrate the Year of the Pig. These stamps have the taste of sweet and sour pork. When you scratch the front of the porcine of the stamps, it smells of the tasty sweet and sour pork and when the back of the stamp is licked, it tastes of the dish too. It was reported that Royal Mail launched Britain’s first scratch ‘n’ sniff stamp in 2001 – they gave off eucalyptus aromas. In Australia last year, the postal service issued a rose scratch and sniff stamp for Valentine’s Day while in 2004, New Zealand postal service issued a stamp which gave off the scent of magnolia. The Swiss have produced chocolate scented stamp and Hong Kong produced green tea flavoured stamps. This entry was posted on Tuesday, January 16th, 2007 at 2:22 pm	and is filed under Interesting Stuff. You can leave a response, or trackback from your own site.